I'd been using an FT-847 with a data modes interface to my PC, completely isolated with transformers in both transmit and receive paths and a mechanical relay to switch the PTT. It used the 3.5mm jack on the rear of the FT-847, which is what you must use for transmitting on SSB (the usual 6-pin mini DIN is for FM transmit only). Everything worked OK on data modes like FT-8 and WSPR, but I noticed that when making a recording of voice, there was something wrong with the frequency response. At first, I thought that this output might be bypassing the de-empasis circuit on FM, but when looking at the frequency response, even on SSB it rolled off below 1KHz. 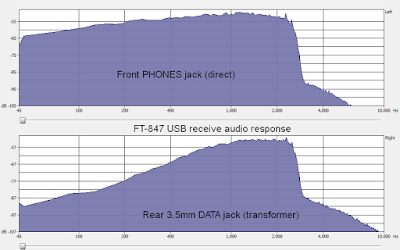 The transformers I used in the interface were from a 'ground loop isolator' designed for car audio systems, and when tested between the output and input of the PC, showed a response within 2dB down to below 100Hz. Eventually I thought about the transformers and their impedance. 600 ohms is a common value for them, maybe there was a mismatch between that and the output impedance of the radio. Checking the schematic for the FT-847, the final op-amp in the 'RX1200' circuit goes to a 100nF capacitor, then this goes through separate 4K7 resistors to both the 3.5mm and DIN sockets.This would explain why there was such a big cut in low frequencies. At the worst case, driving a short circuit, the 4K7 and 100nF would make a high pass filter with a frequency of about 340Hz. The specification of the data output says a 10K impedance, and with a 10K impedance (which would be in series with the 4K7), the frequency would be around 100Hz. That's fine for any voice or data modes, even 340Hz would be usable. But the transformer will also create a R-L high pass filter, with its impedance increasing with frequency (DC resistance is about 100 ohms so increasing from that), against the 4K7 resistor. This output is not really suitable for driving an isolating transformer if you want anything like a flat frequency response. The resistor and capacitor could be replaced with different values (higher capacitance, lower resistance). I had a look a schematics for other radios made by Yaesu, that had a 6-pin data socket. Although they all used similar op-amps to drive the RX1200 output (NJM2902), 3 radios had 3 different combinations of resistor and capacitor in series. That's a 20:1 range of output impedances, although every time this is specified as for use with 10K input impedance on whatever equipment is connected. If you're making a direct connection from the radio to the Line In of a PC or amplifier, it probably won't matter as the input impedance will be quite high. But the circuits for most home built and commercial data mode interfaces have isolating transformers, and will affect the frequency response.